The Flood Warning Section under the Hydrology Division, DHMS is responsible to provide flood warning services in Bhutan. The section is headed by Technical Maintenance Officer (TMO). Flood warning activity is undertaken by the Royal Government of Bhutan in collaboration between the Central Water Commission (CWC) of India mainly to provide early warning for people down streams from floods. Flood warning network stations are established on the northâ€“south rivers that are common to India and Bhutan. 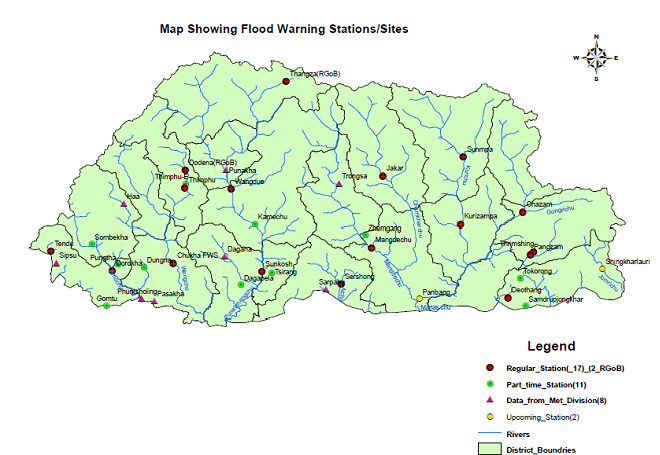 There are more than 28 flood monitoring stations under operation in Bhutan. River water level and rainfall data from these stations are continuously transmitted to designated stations in Cooch Bihar, Jalpaiguri, Nalbari and Berbeta in the Indian States of West Bengal and Assam. The flood warning stations are monitored for 24 hrs during the monsoon season and data are transmitted using wireless sets on hourly basis to stations in India. Glacier Lake Outburst Flood (GLOF) early warning (GLOF EWS) is a service extended to the public by the Department of Hydro-met Services (DHMS), Ministry of Economic Affairs as a part of its civil contingencies to help prepare, respond and recover from GLOF events. Its objective is to provide adequate, reliable and timely GLOF warnings downstream to safeguard life and property downstream. The GLOF EWS system is directly look after by the Hydrology Division, Department of Hydro-met Services, MoEA.